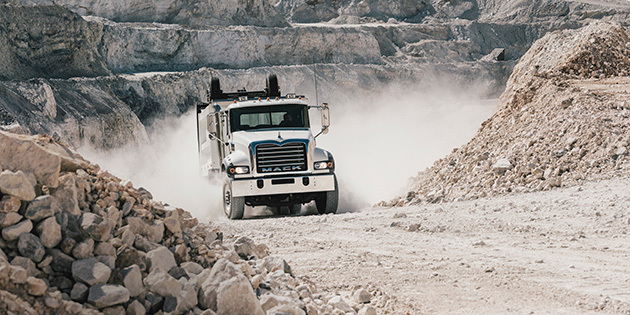 The driveline components on your heavy-duty Mack® truck are built to deliver peak performance. Transmitting torque from your truck's transmission to its axles while adjusting to changes in driveshaft length is a tough balance. Properly functioning u-joints smooth things out by providing flexibility between your driveshaft and axles, even in the most grueling road conditions. Rising to such a difficult challenge is a full-time job. Your u-joints work non-stop while your truck is on the road, and this constant movement and stress can cause wear and tear. U-joint problems can lead to driveline failure and thousands of dollars in repairs. Good news. With proper preventive maintenance, most u-joint issues can be averted. Most of the time, u-joints fail due to inadequate lubrication. Following a multi-point lube check at your Mack dealership, factory-trained technicians will use lubricants that are Pure Mack – designed to keep your u-joints and other critical components doing their job. If you want to install maintenance-free u-joints as an alternative to greasing, you'll need components that meet Mack's high performance standards. For example, select genuine Spicer® heavy-duty u-joints are offered with service-free options, in addition to the standard reliable options. Both are engineered to closely control tolerances, creating a tighter fit, better balance capability and reduced driveline vibration. Operating your heavy-duty Mack truck with excessive driveshaft angles could also contribute to premature u-joint failure. It is recommended that u-joint angles should be no greater than 3 degrees, and the difference in angles between front and rear u-joints on the same driveshaft should not exceed 1 degree. The higher the u-joint angle, the shorter the life of the joint. All driveline components should be closely examined at regular service intervals to ensure maximum longevity. For more information or to schedule a service appointment, call the driveline experts at your nearest Mack Trucks dealership. You can also order driveline components online through SELECT Part Store™, where you'll find monthly specials on popular parts and supplies.